Since the current iteration of the Valiant Universe began, Toyo Harada has been a force to be reckoned with. He's a being of great power and he's got a vision for the world that he intends to achieve by any means necessary. He once acted in secret, but is now very much in the public eye, moving against many of the world's governments to make one last ditch effort to save humanity. In the end, will he be remembered as a hero? Or a villain? 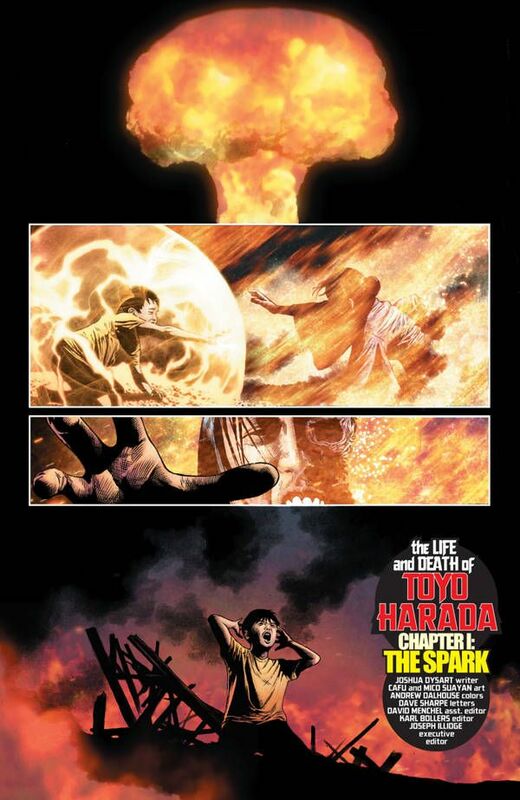 Toyo Harada is a fascinating character, so I was pleased to see a renewed focus on him with this mini-series. 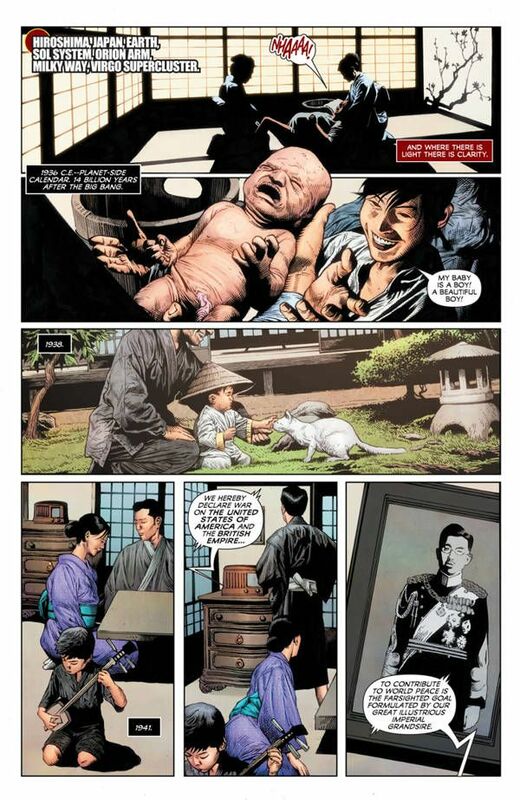 This first issue bounces between Toyo's early days, going from birth to his discovery of his powers, to the present, with his most ambitious project to date. His life is one full of bloodshed and torment. He is constantly swimming against the current in an effort to better not only himself, but the world around him, even if everyone else isn't ready for that yet. There are few greys in Toyo's perspective. Everything is black and white to him. It's either good for the world or it isn't. This creates a skewed moral compass. When he was a boy, he saw his family killed during World War II. This obviously didn't help matters. 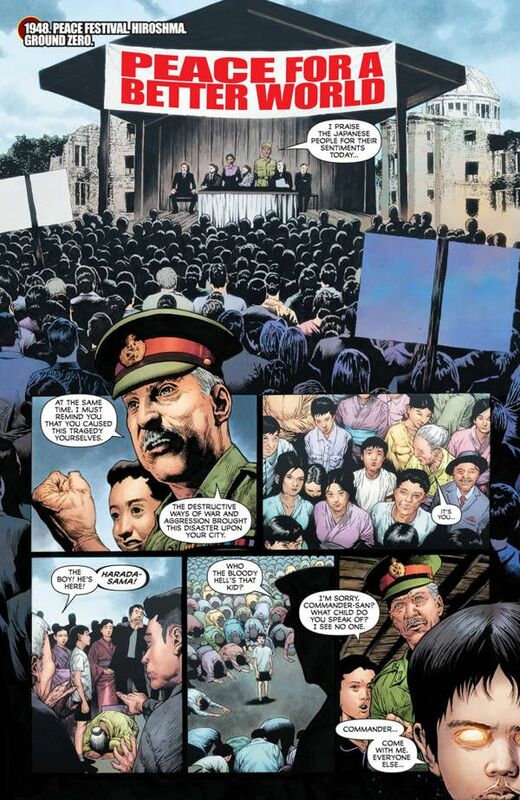 Artists Cafu and Mico Suayan contributed to The Life and Death of Toyo Harada #1, but I don't know who did which sections of the book. These opening pages are heartbreaking as we watch a kid lose everything in a fiery explosion, while also gaining incredible abilities. This moment changes his life forever and helps shape him into the man he would become. The action in the present day is some top-notch stuff. Toyo deploys his super-powered soldiers in a tactical manner to create a space elevator. I realize that sounds a little silly, but there's a reason for this. 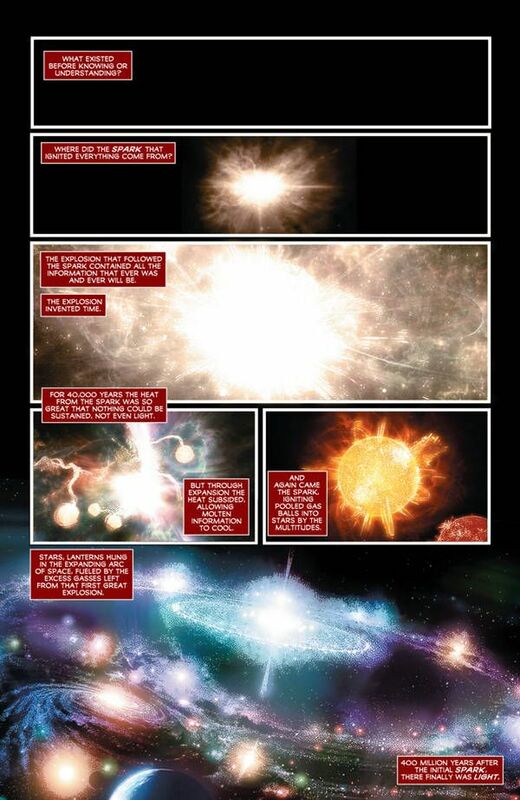 There's a bunch of alien debris floating around in space and Toyo aims to gather it all up, collecting untold amounts of technological knowledge and superiority. This creates a pretty tense scene. There are attacks on all fronts and bloodshed all around. Colorist Andrew Dalhouse creates a gritty atmosphere that makes it clear this is a battlefield. I like how the the pale body of alien LV-99 contrasts against the bright red blood he spills with every slash. Letterer Dave Sharpe adds to the carnage with some jagged black word balloons with a rough white font, creating a monstrous tone. At one point we pull back to get a look at each aspect of the attack in a double-page spread. This is a color-coded breakout with each character's abilities shown in a specific hue to go with the background of the panel. This is a nice touch that instantly shows the size and scope of the opposition. 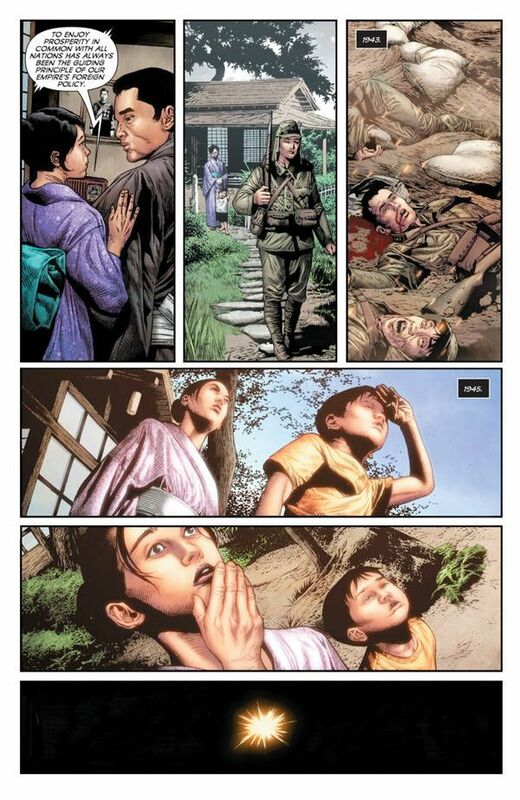 The real terrifying angle of The Life and Death of Toyo Harada comes with Angela. Everything about her is unsettling, mostly because she doesn't have any eyes. There aren't open sockets either. It's just skin. You can't read her and she doesn't have much in the way of emotions anyway. She's created a small monster to accomplish her own goals and it's like a cross between Krang from Teenage Mutant Ninja Turtles and the facehugger from Aliens. Good luck sleeping tonight with that image in your head. It's clear that Angela is a force to be reckoned with and I'm curious to see how she plays in this sandbox. Although Toyo Harada demands respect and certainly deserves it, he's surrounded himself with some of the most deadly and conniving people. Just how far can he trust them? Writer Joshua Dysart creates this tense scenario that never gets old. 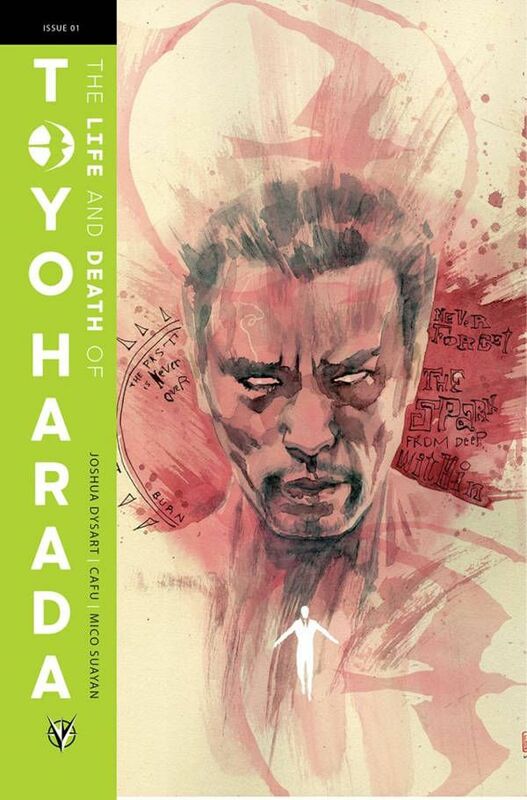 The Life and Death of Toyo Harada is a tense, action-packed thriller with elements of sci-fi and horror weaved in. It breaks down one of the most intriguing characters in the Valiant Universe in a way that humanizes him. It doesn't excuse all the horrible things he's done, but it does provide some valuable context. This is a series to watch.